Sometimes known as God's Acre, the land was bought by West Mersea Parish Council in 1895 from Willoughby John Bean for £140. The first person to be buried here in January 1900 was Elijah Reid. There are some interesting "maritime" headstones. The graveyard has been closed for new burials since the 1940's but family graves can be opened to accommodate other family members. The Town Council own and maintain the cemetery. At the time of writing - a group of volunteers are carrying out a Restoration Project at Barfield Road Cemetery to restore it to its original state and are doing a great job. The Parish Church of St Peter & St Paul churchyard has been closed since 1889 (except for the re-opening of family graves). 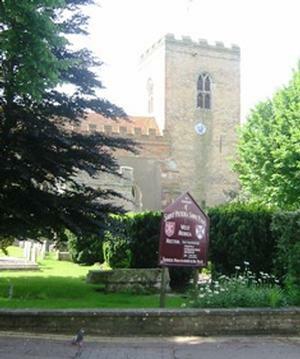 It is mostly maintained by the Parochial Church Council with the Town Council maintaining the trees, shrubs, grass cutting and other essential ground maintenance. The church is 7th century - much of the fabric consisting of recycled Roman tiles and brick. A substantial Roman Villa once stood hereabouts and the churchyard covers part of the Roman mosaic floor of this Villa. Many coffins have been laid on the surface of this floor before being buried.